Repairing and refinishing cracked resin bathroom vanity sink basins isn't just about aesthetics. If you don't repair the surface of the damaged basin in time, the cracks can spread, leading to leaks that can be expensive to repair. Before you even think about attempting to refinish a cracked resin vanity basin, you need to know the appropriate materials to use and the proper way to apply them or you may end up making the damage worse. Dry the sink basin thoroughly using a hairdryer. 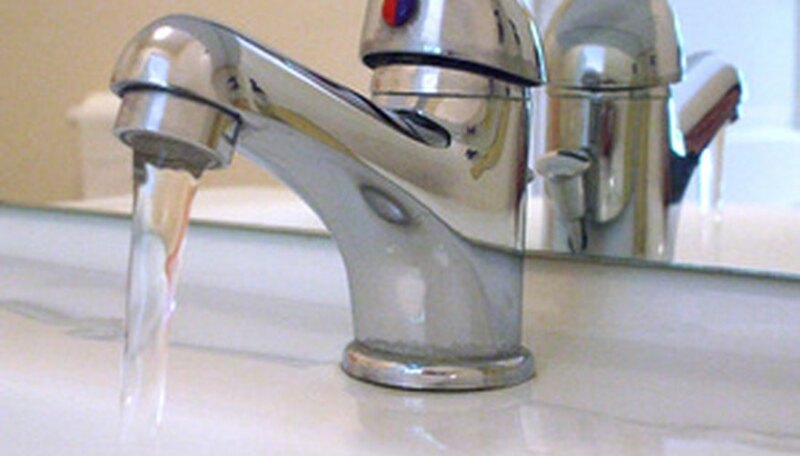 If you are unable to keep water from dripping from the faucet, turn off the water at the main valve. Abrade the surface of the vanity sink basin to promote adhesion by sanding it with 120-grit sandpaper. Apply an epoxy adhesive to the cracks in the resin using a toothpick. Work slowly and meticulously to prevent the adhesive from getting outside the cracks onto the surface of the sink basin. Allow the epoxy adhesive to dry for one full day. Apply blue painter's tape to any areas you want protected from paint. Refinish the resin bathroom vanity sink basin by coating it with spray epoxy or appliance paint. Apply only a thin coat in short intermittent bursts rather than in one, steady stream. Allow the surface to dry for two hours and then apply another coat if necessary. Cracks in a resin bathroom sink basin must be sealed with epoxy adhesive before you refinish with paint. Never attempt to paint over cracks without filling them first or you will see a recurrence of the problem.